After breakfast at hotel, we will transfer to Mui Ne for leisure. Train arrive Danang station at either 11:50 or 14:30. You are driven south to Hoian, which was originally a Cham seaport but has been influenced down the centuries by traders from various cultures. The scenic road is hugging the coastline before crossing over the winding Hai Van pass. A view from the top of the pass is one of Vietnam’s most impressive panoramic scenes of Lang co Beach. You stop en route to visit the Cham Museum in Danang City, China Beach and the Marble Mountain. There is some free time for your own exploration in Hoian until we transfer to Danang train station for overnight train to Hanoi, Train departure at 14:45. Overnight on the train to Hanoi. The train arrives early morning; you will be met at the railway station you'll have the chance to see early morning life in Hanoi as the locals do their morning exercises and Tai Chi. You'll also get to see the unique flower market before heading for Vietnam’s number one destination - Halong bay. 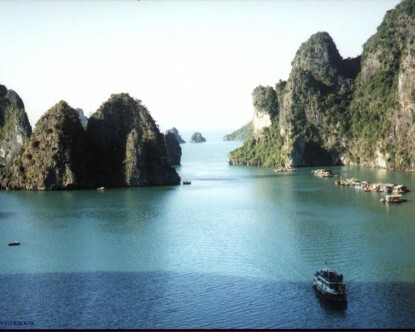 Transfer out to the internationally famous and stunningly beautiful Halong Bay from a two day cruise. Continue your cruise through the bay after lunch return to Hanoi. There is some free time for your own exploration in Hanoi until we transfer to railway station for overnight train to Lao Cai. Arriving in Lao Cai early morning In the afternoon, visit the local market before you drive downhill for about half an hour to start a short walk to Trung Do village, of the Tay minority. Here you can visit a traditional Tay house, before getting on a boat for a cruise upstream the Chay River to experience the picturesque scenes on the river banks. you then cruise downstream to the Bao Nhai, where you get in the car and head for Sapa. Overnight in Sapa.